Friday night's show at The Empty Bottle paired one of the city's finest music venues with one of its finest bands, throwing in two very pleasant surprises for good measure. Hot off the release of their second full-length, The 1900s tore through a set that put a whole lot of fire into folk-pop, while Tristen and Tyler Jon Tyler proved why you should always get to shows early. 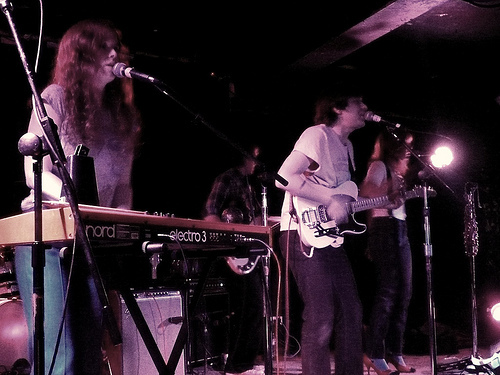 The night began with bright, honeyed vocals and upbeat, jangly tunes supplied by Tristen and her band. At first that bizarre-yet-not-uncommon concert space barrier came between the Nashville musician and the crowd, with everybody cautiously nodding their heads to the beat quite a few feet away from the stage. But when the singer asked us to come closer ("I'm from here, I know Chicagoans aren't shy"), we listened, and things got much warmer from there. Folky, poppy, bouncy and heartfelt, this girl's got a very good thing going on. Listen to her song "Baby Drugs" and see what I mean. Tyler Jon Tyler took the stage next. Based on the name alone it would have been reasonable to expect some sort of one-man singer-songwriter act, but that was certainly not the case. What we got was actually a female-fronted rock trio. The band's sound was overall taut and minimalist, but not without a helping of pop elements that kept things fun and interesting throughout. All of the songs were short, as was singer/guitarist Rebecca, whose petiteness couldn't have prepared any unsuspecting audience member for her commanding howl. The sound was so consistent that many songs were somewhat indistinguishable from others, but the band's tightness and uniqueness made that easy to look past. Keep an eye out for this band. Check out Loud Loop Press's recent album review to get better acquainted. For as much as I've loved records by The 1900s over the past few years, I somehow had never been able to swing catching one of their live shows (not even last month's set at Fireside Bowl, which fellow WCR-er Andrew attended and reviewed). I know that's a bit criminal for a local indie rock enthusiast considering they're pretty much Chicago staples, so I was particularly pumped when the sextet began to play Friday night, feeling like I could at last consider myself a true, card-carrying 1900s fan. They kicked off with "Amulet" and "Babies" - two tracks from their new sophomore LP, Return of the Century (reviewed here), and I was instantly surprised by how much more rocking they sounded live as compared to on record. The breezy folk-pop tunes took on a whole new bite, which was true even for the most relaxed material, such as "Lions Fur" and "Bmore." The bulk of the 12-song set was culled from Return, but two old tracks did show up: an extended, rave-up version of "Two Ways" off 2007's Cold & Kind, as well as "Bring the Good Boys Home" from the Plume Delivery EP, which closed the night. Both were highlights, but there really were no lowlights. As is the case on the new record, all three vocalists - Edward Anderson, Caroline Donovan and Jeanine O'Toole - got turns at the helm, and each sounded fantastic. Friday's Bottle crowd got to see and hear firsthand one of the things that makes The 1900s such a strong band - its various members' individual personalities and talents adding up seamlessly to create an awesome whole.